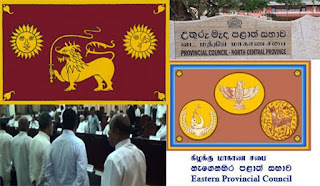 The provincial governor unanimously decided to take legal action against the postponement of the provincial council election by the UNP government, breaching the universal franchise right of the people. The decision was taken at the governors’ meeting held in Galle. This meeting was held at the Southern Provincial Governor's office located at Upper Dickson Road, Galle on the 23rd of this month. The purpose of this summit was to review the problems faced by the people under the Provincial Administration system, the administrative issues faced by the officers, the review of technical issues in dealing with the central government and the role of governors in the prevailing political context. At the conclusion of the meeting, the governors who were present at the press briefing stated that they would take legal action against the postponement of provincial councils and protest against the situation. Provincial Governors unanimously said that legal measures will have to be taken against the government if provincial development activities are continuously affected by the delay of provincial council elections. Central Province Governor Maithri Gunaratne said that a financial crisis had erupted in some provincial councils to due to impediment created. It was stressed in the press briefing that due to the prevailing situation, the provincial council elections need to be conducted expeditiously before the Presidential election, as 85% of country’s administration work is done by the provincial councils. Therefore, it is instrumental to hold a provincial council election immediately.